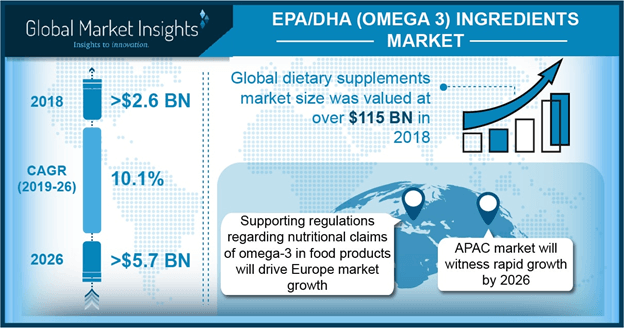 (Omega 3) EPA/DHA Ingredients Market size expects gains at over 11% to surpass USD 4 billion sales by 2022. EPA/DHA ingredients market size from dietary supplements application could surpass 95 kilo tons by 2022. Strong trends witnessed for rise in nutrient based fortified foods consumption owing to myriad health benefits should drive omega 3 ingredients market size. Global nutraceuticals industry which comprises of supplements and food & beverages generated over USD 170 million sales in 2014. Nutraceuticals help in maintain proper body metabolism and functions to help prevent arthritis, cardiovascular diseases and cancer. Fish oil constituted a major source for EPA/DHA ingredients market share and algae oil & flax seeds are some alternatives for product extraction. Sardines and anchovy, combined contributed over 75% of the feedstock share for product extraction. Positive indicators for rise in function food demand for health benefits and avoiding expensive medical treatments should drive EPA/DHA ingredients market size. In 2014, Japan function food industry generated over USD 9.5 billion. U.S. and Europe functional food market share consisted of over 30% and 28% in 2014. Omega 3 ingredients form an important part for overall infant development with formulation resulting in numerous health benefits. Key companies, Nestle and Similac, have diversified product lines constituting EPA/DHA ingredients and are investing in research to expand their existing portfolio. FDA has also confirmed with health claims by consuming traditional foods fortified from EPA/DHA ingredients which can result in lowering cardiovascular risks. Approximate minimum intake of 500 milligrams per day has been suggested by The American Dietic Association to benefit health wise. Consumer perception towards taste and smell from fish oil along with vegetarian base population base may act as growth constraint. Many consumers tend to refrain from fish oil usage owing to distinctive taste & foul smell. Technology innovation encapsulation & improved extraction process should pave way for product formulation in dietary foods and drive omega 3 market size. EPA/DHA ingredients market size from dietary supplements application generated over 1 billion business n 2014. Positive indicators for rise in sport nutrition product consumption for maintaining fitness should drive omega 3 market size for dietary supplements application. The industry has also witnessed numerous dietary supplements product launches which help an important role in reducing cardiovascular diseases and provide essential nutrition. EPA/DHA ingredients from pet feed applications should witness significant gains at over 5% over the foreseeable period. Omega 3 formulated pet foods along with health label claims should attract buyers wanting to provide significant nutrients in their pet diet. Pharmaceuticals should witness highest gains in EPA/DHA ingredients market size and generate over USD 500 million business by 2022. Increasing application scope in pharmaceutical formulations to reduce LDL cholesterol levels in the body should drive omega 3 ingredients demand in pharmaceutical applications. EPA/DHA ingredients derived from sardine/anchovy should register over 60 kilo tons by 2022. Key countries for fish oil production include Peru, Scandinavia and Chile. Limitation on Peruvian anchovy fishing has led to decrease in raw material availability which resulted in increase of overall price of this oil type. This factor has put pressure on raw material supply demand and has affected EPA/DHA ingredients market price trend. With decreasing anchovy supply, algae and krill can be an important raw material source for product formulations. High concentrates EPA/DHA ingredients market prices are higher in comparison to other counterparts. High concentrate oils occupied smaller chunk of global share but formed major revenue share due to high pricing. High concentrates should witness an increase in application scope in pharmaceuticals and functional food industries due to growing importance of purity level in product formulations. Algae oil demand from EPA/DHA ingredients industry should witness significant gains at over 8%. Preference of product consumption based on plant based formulations should drive algae oil demand in product formulations. North America, led by U.S. EPA/DHA ingredients market size, should exceed 50 kilo tons demand by 2022. Increasing consumer awareness towards omega 3 ingredients rich formulations for infant feed along with new product launches for dietary supplements applications should drive regional industry growth. Europe, dominated by France and Germany EHA/DHA ingredients market size, should witness gains at over 3.5% by 2022. Europe omega 3 market size has numerous product formulations and is dominated by functional food and dietary supplement applications. Asia Pacific, led by China and Japan EPA/DHA ingredients market size, expects significant gains over the foreseeable period. Ageing population base along with rise in per capita spending capacity should drive product demand for dietary supplements application. EPA/DHA ingredients market share represents intensive competition and is fairly consolidated with top for players catering for over 50% of the industry demand. Major industry players include DSM, Croda and BASF. Other prominent companies include Omega Protein, Epax SA, Arista Industries, Marine ingredients and Copeinca ASA. EPA/DHA ingredients industry may witness further consolidation as a part of their growth strategy. This inorganic growth strategy would help companies in increasing their regional presence and diversifying product portfolio. Invest in research to launch new products is also an innovative strategy adopted for company growth. Omega 3 fatty acids include ALA (α-linolenic acid), EPA (eicosapentaenoic acid) and DHA (docosahexaenoic acid). These are essential owing to the fact since mammals are not able to produce them and are form an important part for regular metabolism. These are PFAs (polyunsaturated fatty acids) which are majorly derived from marine and plant life. Fish, flax and algae form common raw material source for EPA/DHA ingredients market. Fish oil is most commonly used due to high concentration of required product. Omega 3 ingredients form are associated with major health benefits and are increasing forming an important part of the regular diet through supplements and functional food intake.